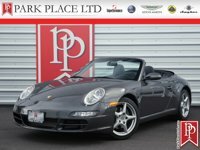 Only 13,629 Miles From New on this 2006 Porsche Carrera Cabriolet. Beautifully finished in Slate Grey Metallic with Black Top over an impeccable Grey Natural Leather Interior, this 911 Carrera is truly 'As New' condition throughout. 3.6L 325hp 6-Cylinder Engine. Tiptronic S Trans. Original MSRP was $101,160 with an impressive $18,965 in factory installed options, consisting of; the aforementioned Slate Grey Metallic paint ($3,070) along with the previously noted Natural Leather Interior in Grey ($4,875) and the Tiptronic S Transmission ($3,420), Navigation for PCM ($2,070), Bose Hogh End Sound Package ($1,390), Power Seat Package ($1,550), Bi-Xenon Headlight Package ($1,090), Park Assist System ($530), Exclusive Options ($490), Heated Front Seats ($480). Steering wheel in smooth leather, windstop, owner books, extra key, window sticker. Just had oil service and brand new battery. This is a great looking Carrera Cabriolet that has been adult owned, meticulously maintained and properly serviced. Runs and drives excellent and shows in superb condition throughout. This Carrera Cabriolet is 'In The Wrapper' - don't miss out. The leather seats in front, tailored in optional Grey Natural Leather, are firmly bolstered, deeply contoured and heated, offering miles of comfortable driving. The Porsche 911 Carrera is considered as one of the most iconic models in the history of the industry. There aren't many sports cars that have been around as long as the 911, and none that have stayed as true to the original's formula. At the same time, Porsche has managed to transform the 911 into a modern sports car with the performance and amenities buyers expect. It's an icon of the sports car world. Carrera Cabriolets have earned a cult-like following and are highly desirable 911's, as they combine the best parts of the 911 range. Starting with the widebody that is shared with the turbo model, the Carrera adds sport tuned suspension. It has a menacing look and is equally happy being driven top-down on a warm summer day as it tackling the dreary winter evenings. For more information on this fabulous 2006 Porsche Carrera Cabriolet, or any of our 40+ Porsches always in stock, contact one of our friendly and knowledgeable sales consultants or always feel free to stop by our Bellevue, WA Park Place Ltd campus - where we have over 40,000 sq ft of indoor showrooms filled with the finest cars. As part of the Park Place Motor Group family, which includes Park Place Aston Martin and Lotus of Bellevue, we always have 200+ High-Performance, Luxury, Exotic, Sports, and Special Interest cars always in our inventory, Park Place Ltd is Home to the West Coast's Most Diverse Inventory of Luxury, Exotic, Collectible and Special Interest Automobiles. With 200+ Always On Site, Nobody Has What We Have!